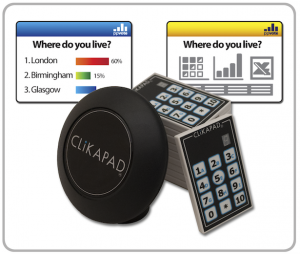 The CLiKAPAD audience response system consists of two elements: hardware and software. We also have a full suite of software options that can be used with the CLiKAPAD hardware. You can either use our software packages or alternatively you could consider developing your own bespoke software system that is completely suited to your specific requirements. The CLiKAPAD systems allow you the ability to collate anonymous feedback from groups and audiences then instantly display the data as a graph within a PowerPoint presentation. The system has a wide variety of uses: you could be polling opinion, testing employee knowledge or adding some fun interactivity to a talk or presentation. Every member of the group or audience will be provided with a piece of hardware – a voting keypad. They can then use this to cast their vote on the topic or question that appears on the screen. The voting process is anonymous. The answers are then sent to a receiver which will immediately collate the data into attractive graphs that display the results back to the audience. This voting process is far faster, more efficient and more accurate than having data collated using traditional pen-and-paper methods. With traditional methods of gaining audience response and feedback – such as asking for a show of hands – research has shown that there can be a tendency for people to often follow the crowd, meaning you will get biased and influenced results. With CLiKAPAD voting keypads the whole process is anonymous and questions are answered honestly without the possibility of them being influenced.